When most people think of Marv Wolfman, the first thing that immediately comes to mind are The New Teen Titans or the Crisis on Infinite Earths maxi-series. There is no doubt that Wolfman is a writer extraordinaire who knows how to plan/plot/script a successful superhero title. Few realize he is an excellent horror writer as well. 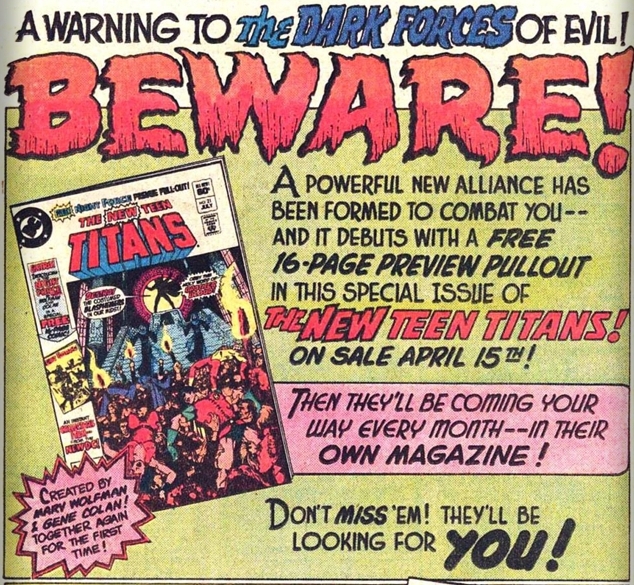 One of the first things Wolfman did when he began working for DC comics was a relaunch of the Teen Titans (AKA: The New Teen Titans) in 1980. 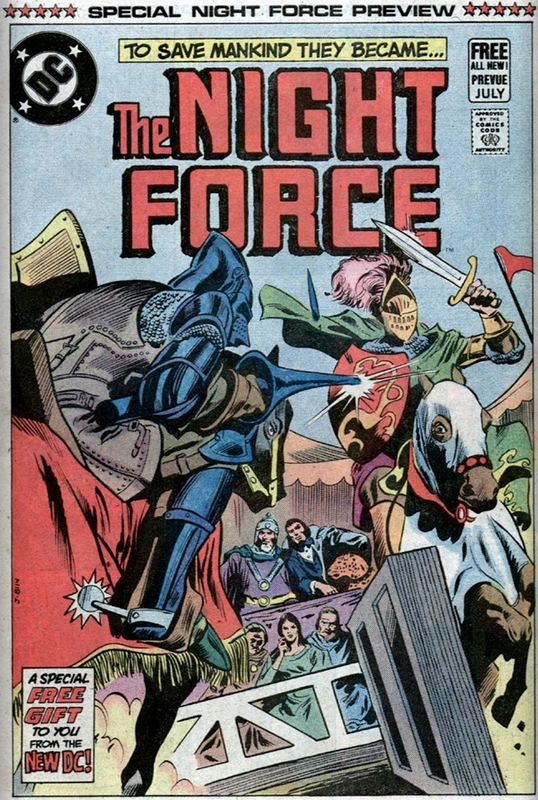 The New Teen Titans quickly picked up momentum and established Wolfman as a rising star in DC comics, effectively allowing him to propose new projects - one such project being Night Force. Night Force first premiered as a 16 page preview in The New Teen Titans #21 (a book Wolfman was writing at the time). What was notable about this series is that Wolfman had reassembled the entire creative staff of The Tomb of Dracula for this series: Gene Colan on pencils, Michele Wolfman (his wife) as colorist, and John Costanza as letterer. Once the cast of characters were revealed (ex: Baron Winters, Rachel Van Helsing), many speculators believed that this was going to be the continuation of The Tomb of Dracula series, but published by a rival comics company (keep in mind that Dracula is public domain and can be published by anybody) and a final “get bent” to Jim Shooter and Marvel comics from Wolfman. 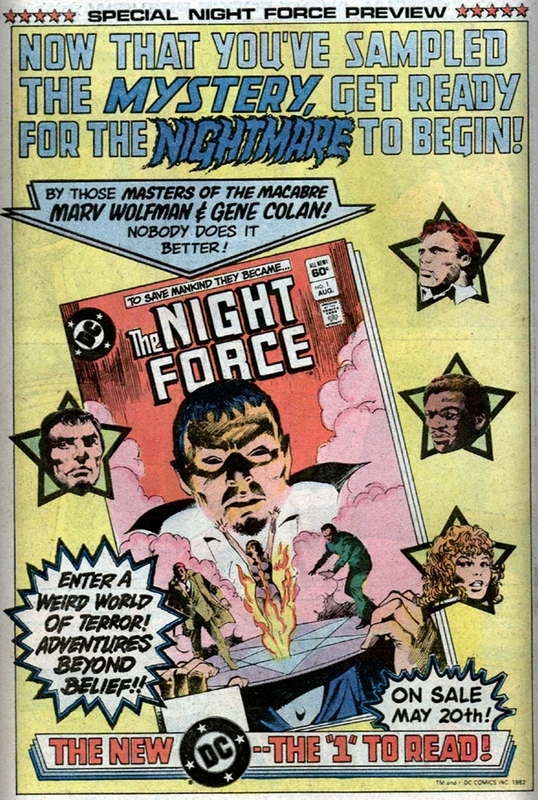 This was not the case whatsoever as Night Force was a totally different type of mystery/horror/supernatural title. Night Force lasted 14 issues, but only because horror comics were on the decline when this series appeared. DC recognized this and decided to go ahead and publish anyways. Some might speculate that Wolfman was a 'hot new trailblazer' and DC wanted to keep him happy, but I’m going to say it’s because DC recognized a good thing when they saw one and ran with it. Afterall, Jenette Kahn was publisher/president of DC comics and was willing to take more risks experimenting with new ideas and formats. Some fans have stated that Night Force is ahead of it’s time, and I’m inclined to agree. Night Force is about a mysterious operator, Baron Winters, who gathers agents to battle supernatural threats for him. His agents are typically normal people who were manipulated into working for him somehow. What sets this series apart from the get-go is that in the first issue letter column Wolfman basically tells the reader that this series will have a rotating cast of characters. Wolfman was not against evolving/killing main or supporting characters in the interest of story development, so the reader would never be able to predict how the story was going to end. In brief, it’s like an occult version of the 'Suicide Squad’. The series was written in a new experimental type of novel form (chapters and etc), and the first story arc took 8 issues to resolve. Another interesting thing to note was that the penciller of this series, Gene Colan, was the same one who penciled the entire 70 issue run of Marvel’s The Tomb of Dracula. Colan is excellent at depicting facial expressions on characters as well as setting an occult/macabre mood to his illustrations. The writing and art of this series reminded me of DC’s House of Secrets and House of Mystery books, except with more pages per issue dedicated to a much longer story. Most importantly, Night Force was created by Marv Wolfman AND Gene Colan. The series received incredible fan mail reaction, but unfortunately sales were sluggish. Every letter column ended with Wolfman encouraging you to introduce this series to your friends, otherwise it would get cancelled - I recall Wolfman often promoting Night Force in The New Teen Titans letter column, as well. due to the long story arcs and lack of story re-caps, it was difficult for new readers to jump in without reading the back issues. In the end, the series was cancelled due to lack of readers. In an interview with Jim Kingman (Back Issue Magazine #27, 2003), Wolfman theorizes that had DC only marketed the title to the newsstands, it would've been more successful - the title sold really well on newsstands and not so well via the Direct Market (i.e. comic book shops). This was too bad because the series was great and the premature ending left a lot of unanswered questions. If Night Force had continued, there were tentative plans to work other supernatural DC characters (ex: the Spectre, Phantom Stranger, Dr Thirteen, etc) into the series. Annual 4-issue Night Force mini-series’ were planned for the next following years, but the idea never materialized. This article originally first published August 2013. I come across Night Force from time to time during my travels, and have snagged a few of the issues. I have not yet built enough of a run to give it a fair read thru, but it is one on my ever-growing and oft-neglected "read pile". Marv Wolfman is an all time favorite, and because of his New Teen Titans run, always has my readership. I thought it was curious that the latest series was released so (relatively) recently. I wonder if its an "in continuity New-52" style book, or just a non-canon tale Mr. Wolfman wanted to tell. I'll have to keep my eyes peeled for this one.